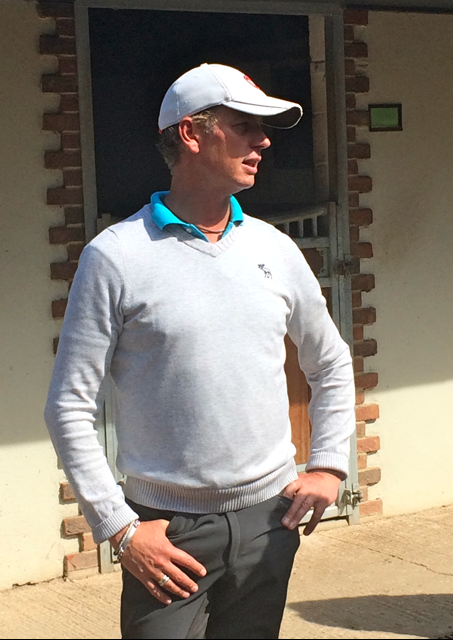 A Morning At Carl Hester’s Yard – Lots of Top Tips from the Maestro Himself. Supergroom Alan brought Uthopia out for us all to see. He looked fantastic. I was incredibly fortunate to be given the opportunity to attend the Open Morning at Carl’s yard last month, to watch him, Charlotte and Amy (Woodhead) training, hear him explain their training methods and ethos, and get to meet and photograph some of the very illustrious residents. 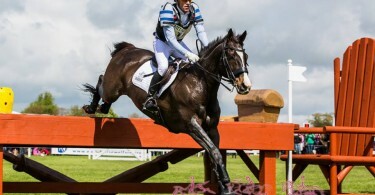 If anyone is wondering what this has to do with Eventing… some of us remember when Carl was an event rider…! Of course his advice applies to Dressage across the board. Here are some of Carl’s words of wisdom. You need a brave horse to compete at top level, to cope with the atmosphere and so on. The warm-up area is often quiet but then the arena is a different matter. The horses need to have a really good attitude – to like to work. They need a great canter, one that steps under & pushes the forehand up. A really good hindleg is the only ‘type’ that he looks for. Walk – so difficult to correct if it’s wrong. Trot – can be improved a lot. 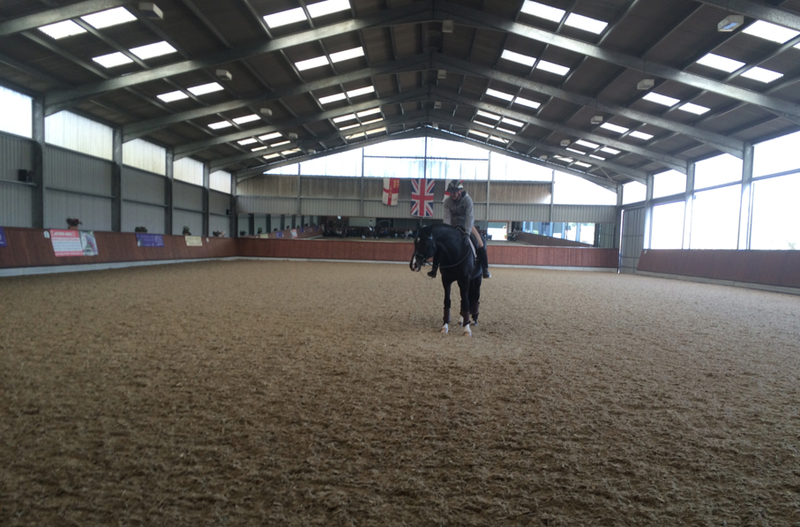 Alan and Uthopia in the stunning indoor school, which is open on one side so very airy. The shorter the walk, the more active they tend to be… Easier to train the piaffe. Because he and Charlotte have ridden so many, and have multiple horses in work, when a young horse doesn’t go well it feels normal for them, whereas a one horse owner is more likely to be worried by a problem on a particular day. They look on a naughty horse or one with lots of character as a good thing. Young horses will either prefer a lot of contact or none… it is harder to fix a horse who doesn’t want to take a contact. There is a difference between being light & behind the bit. Alan and Valegro, who was brought out and stood up for us to see… and we were allowed to pet him too. He is an incredibly self-assured horse, and when Carl said he couldn’t remember how many medals and Championships “Blueberry” has won, the horse turned his head and gave him SUCH a look… we were all in stitches. Transitions – the key to getting the horse on the aids. Come back, ride forward, repeatedly. With a young horse you have “six years of dreams”. “Legs saying canter hands saying walk” for a short while to increase the engagement. They do NO sitting trot on the young horses. Charlotte worked a horse in leg-yield (at a pretty significant angle, a great cross-over) in rising. So the horse hasn’t got to carry you as well as learn something. Stay rising to build strength in the back. Stretching is important, both physically and mentally. 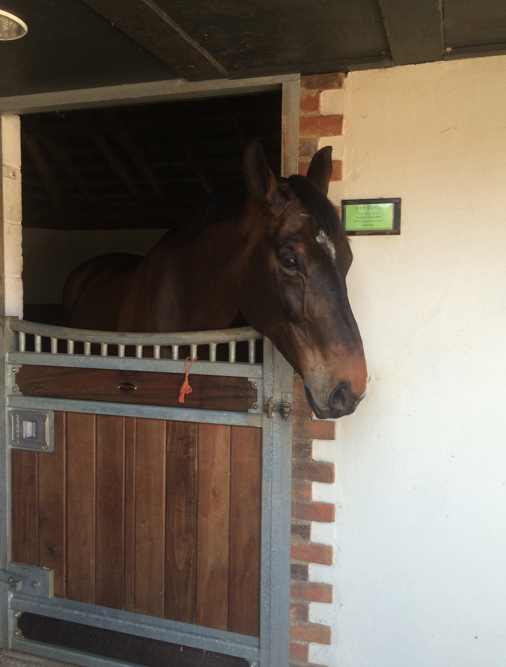 Need a rider with a sense of humour for a horse with a sense of humour! When you buy a big canter you must train the opposite (train the canter to be smaller) & vice versa. They usually don’t train with the whip… they’ll go over and pick one up (off the top of the kickboards) for a particular movement, then put it down again. The horses learn this. Nip Tuck, who Carl rode for us, before being put back out in the field… he lives out. Working there as a rider is “about learning how to train horses”. Get the canter nice & small and bouncy. Do it changing the rein at first (so the horse expects the change of leg). Not going for a 10 at first. Then do on long side for straightness. Collected trot should feel like a contained med trot. 1 year is not a long time in training terms. He likes them to be very fit. Valegro goes on a water treadmill three times a week. Carl stood and answered everyone’s questions for ages, he was incredibly patient! Charlotte, in spite of all the riding, goes to the gym four times a week. Core strength exercises in particular. They and the horses have weekly physio sessions. The horses are all worked 4 days a week only. Out every day. Some, like Nip Tuck, live out. All work should be able to be done in a snaffle. Double bridle is not an instrument to get the horse’s head down! A good Dr rider should be able to take a risk. Ride forward cover the ground. The 1s (tempis) must be bigger than the canter. The point of the training exercises is to find things to make it easier for the horse. Find something EASY then finish the exercise!! As carries on trotting, 1/2 halts get through & there’s a big improvement. Valegro is better this year because he’s stronger, he makes fewer mistakes. 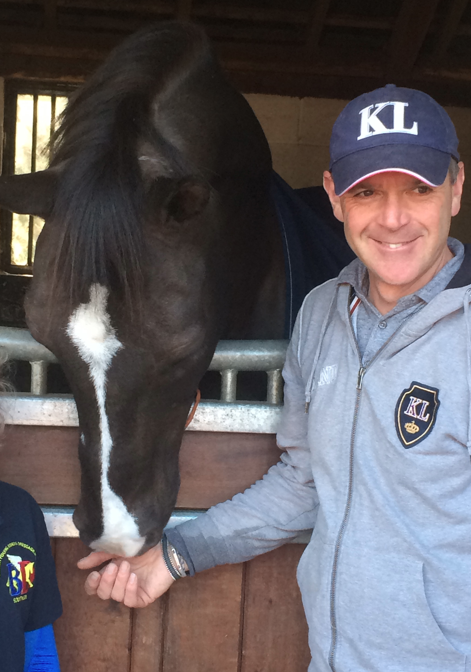 Taking over someone else’s horse – 1 yr to get used to each other, other people’s aids etc. 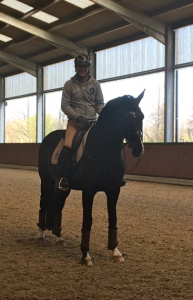 If there is not enough impulsion in canter – the head & neck get ‘noddy’. Lots of Transitions within pace as well as different paces. Hot horses don’t get mentally tired but do get physically tired which makes them more difficult. 1/2 pass, keep swinging. Slowing down loses swing. There are times when you must NOT ride forward. E.g. When the horse feels heavy, strong, unbalanced. Bend. Correct amount – see inside eye. Wait till all neck & back muscles are moving. Carl imagines there’s a plait just behind the ears, highest point. 1/2 halt – lasts for a stride. Take it, touch it, release it, forward again. Leg yield in canter – stretch hindleg. Looser rein, looser hand, with horse like this (hot) – Carl rode his 11 year old GP horse Nip Tuck. To activate hindlegs up – tap whip on top of quarters. To send forward – use the whip lower. To help horse get through feel of coming through more from behind. The difficult thing is to get on a horse and steer it without hanging on. Contact gets lighter as horse goes up the levels. They work on that every day! Sincere thanks to Carl (and his team and sponsors) for the experience, and for permission to publish this. 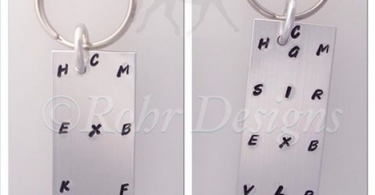 A Great Little Idea for Running Through Your Dressage Tests. Thank you Kerry, this was one of the best ever articles! Concise and to the point! SOOO Much helpful information in just a couple of pages! I wish Carl did a clinic on East coast US! Though not a dressage rider, I would have loved to school my horses with him! I just finished reading Carl Hester’s biography “MAKING IT HAPPEN” and still have tears in my eyes about Mitch and him being chosen for the final chapter of this outstanding book. It shows that Carl really loves horses, really loves what he is doing and – means it. A breeder of German Sports Horses (dressage and show-jumping) in Italy for 25 years (see web-site above), I would sincerely wish that Carl could find the time one day to see our yard and our horses, because we seem to be sharing all his views (including a “Mitch” who in our Yard is “FELIX”) but need a person on top level of riding to give us a helping hand to make our philosophy known. The above instructions are so clear, understandable and precise that they deserve to be translated into other languages to get them transparent also to riders who do not speak English (very many here in Italy!) 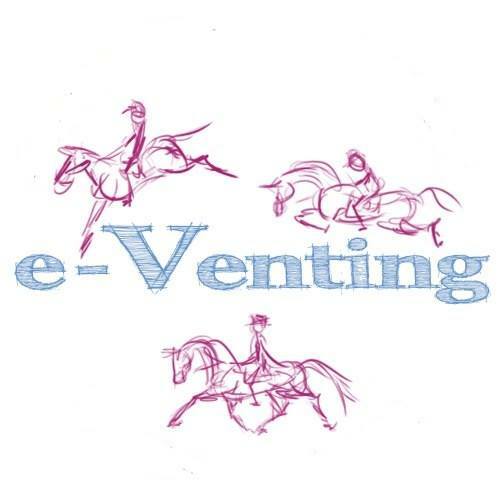 Being fluent in three languages (German, English and Italian), a translator and journalist and a down-to-earth horse-woman like Jannie, I would be more than happy to help Carl getting his views distributed to as many riders and horse-people as possible. Like this – thank you!